The SHAPA Awards 2017 returned to the Manchester Museum of Science and Industry 25th April to showcase the achievements of companies and individuals in the solids handling and processing industry. Russell Finex was shortlisted in three of the awards categories, highlighting another successful year for the industrial sieving specialists. Having taken home the Exporter of the Year award in 2015, Russell Finex again hoped for success in this category. The company was also in the running for the Innovation Award, having previously won the award in 2016 for the Russell Screen Changer™. Finally, Russell Finex was shortlisted in the SHAPA Company of the Year category. 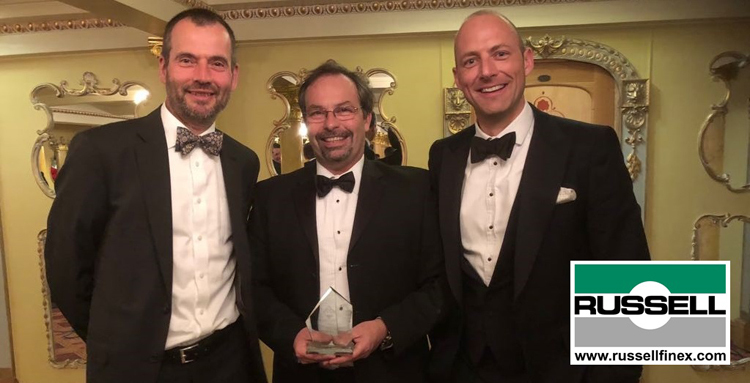 After much anticipation, Russell Finex was awarded the SHAPA Innovation Award for 2017 for the new Russell AMPro Sieve Station™, an AM powder handling system specifically designed to enhance the 3D printing industry. This metal AM powder handling system has been specifically designed to overcome the challenges associated with the recovery and requalification of AM powder before and after the build process within DMLS, LMD, SLM, SLS and EBM systems. This is the most advanced AM powder handling system on the market, with many unique features that have been designed to support the entire additive industry whether at start up, prototyping stage, or a full-scale AM mass production facility. As the system is modular, users can adapt the unit as their business upscales or changes technologies. Since its establishment in 1934, Russell Finex has enjoyed steady, strategic growth ensuring the reputation of a global leader in the design and manufacture of separation technology. Russell Finex is honoured to have been rewarded by SHAPA once again for achievement in the industry and would like to congratulate all other SHAPA winners and shortlisted companies.